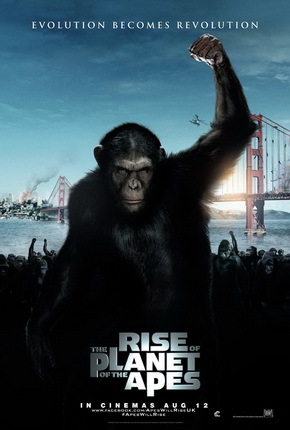 Thanks to strong reviews and great word of mouth, Rise of the Planet of the Apes exceeded all expectations to debut at number one with a strong $54 million (we originally predicted a $40 million top spot opening). This is the second prequel/reboot of the summer, the first being X-Men: First Class with a nearly identical opening number and similar glowing reviews. Both films come from Fox, who really should be pleased with Apes’ solid start, done without the aide of overpriced 3D tickets to boot. While it will likely be another summer blockbuster to miss the beloved $200 million mark in North America, the film should do steady business over the next few weeks. As predicted, The Smurfs grossed $21 million to hit the number two spot at the box office. The film is clearly critic proof and is benefiting from being the only new family film currently in release. The Smurfs has made $76 million in two weeks. Cowboys & Aliens dropped 56% from it’s first place showing last weekend, bringing it $15.7 to land at number three, pretty much the amount we predicted it would bring in. Consider the film an expensive flop for Universal, as it had a budget of $163 million and has only grossed $67 in two weeks. Debuting in fourth place with a paltry $13.5 million is the Jason Bateman/Ryan Reynolds comedy, The Change-Up (we predicted a third place showing with $19 million). Ryan Reynolds is probably smarting from this, as it’s another poor showing for him following the disastrous run of Green Lantern. Whether it was the glut of better reviewed R-rated comedies so far this summer or an unoriginal premise (two men switching bodies), audiences were clearly uninterested in The Change-Up, which should be out of theatres in no time. Rounding out the top five with $13 million (as predicted) was Captain America: The First Avenger for a total gross of $143 million in three weeks. Not a bad showing, but the film needs to make another $40 million more in North America if it wants to to catch up to Thor‘s gross, something I’m doubtful will happen. Next weekend, Rise of the Planet of the Apes will take on three challengers for the top spot – the comedy 30 Minutes of Less, Final Destination 5 and Glee The 3D Concert Movie. Check back on Friday to see our predictions!